This two-part course illustrates a frequently underused and underestimated type of dentistry. Direct composite resin restoration is often a second thought when one considers the treatment modalities available to them. Given the conservative nature of direct bonding many patients will select it over veneers or other options. Some consider it a lost art over taken by a faster more durable form of cosmetic dentistry. However, Dr. Willhite shares his philosophy on why it should be considered and shares information regarding the longivety and strength of direct resin. This course covers conservative preparation design, adhesive placement techniques, cosmetic contouring and finishing of anterior and posterior direct composite resin restorations. Discover a step-by-step approach using direct composite resin restorations. Learn how to perform shade matching and color mapping. 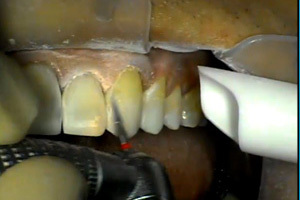 Understand the importance of using a layering technique to achieve a natural looking restoration. Learn conservative preparation design, adhesive placement techniques, cosmetic contouring and finishing of anterior and posterior direct composite resin restorations. Spear F. Occlusal considerations for complex restorative therapy. In: McNeill c (ed). Science and Practice of Occlusion. Chicago:Quintessence, 1998:451.Pilliar R, Smith D, Maric B. Fracture toughness of dental composites using the short-rod fracture toughness test. J Dent Res 1986; 65:1308-1314. R W Wassell, A W Walls, J F McCabe. Direct composite inlays versus conventional composite restorations: 5-year follow-up. J Dent. 2000 Aug;28(6):375-82. L. Knobloch. Fracture toughness of packable and conventional composite materials. The Journal of Prosthetic Dentistry, Volume 88, Issue 3, Pages 307-313.Kim KH, Ong JL, Okuno O. Microfracture behaviour of composite resins containing irregular-shaped fillers. Journal of Oral Rehabilitation. 2002; 29(12):1165-1173.